Mini Bomb Karts are bomb-like objects found in Mario Kart 64. They appear on two different occasions: First, they can be seen in the VS mode of the game, serving as obstacles. 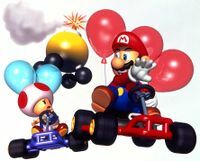 Second, when a player loses all of their Balloons in Battle Mode and if there are at least two players left, they turn into a Mini Bomb Kart. In this state, they may drive like before, though they still count as having lost the battle. Instead, when they collide with a real driver, they explode and make the driver they crashed into lose one Balloon. Once exploded, the Mini Bomb disappears. At this point, the player is unable to participate further and must wait for the battle to finish. As a Mini Bomb Kart, the player is no longer displayed on the course's map and can no longer use items. Items can also hit the Mini Bomb Kart in the same manner as items hitting a racer; they do not explode if they hit an item. Additionally, when the player places fourth place or lower in the Grand Prix, they will drive away from the victory celebration. A Mini Bomb Kart appears and will run into them, sending them into the air. If the player hits a Mini Bomb Kart in battle mode with a Starman or another Mini Bomb Kart, there will be no explosion and the Mini Bomb Kart will just disappear. This page was last edited on March 7, 2019, at 02:46.